Towner, Jonathan S., et al. 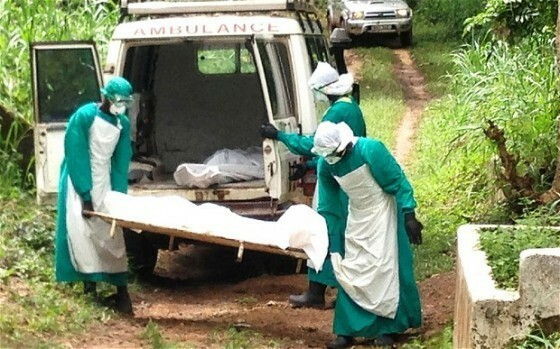 “Newly discovered ebola virus associated with hemorrhagic fever outbreak in Uganda." PLoS pathogens 4.11 (2008): e1000212. Baize S, Pannetier D, Oestereich L, Rieger T, Koivogui L, Magassouba N, Soropogui B, Sow MS, Keïta S, De Clerck H, Tiffany A, Dominguez G, Loua M, Traoré A, Kolié M, Malano ER, Heleze E, Bocquin A, Mély S, Raoul H, Caro V, Cadar D, Gabriel M, Pahlmann M, Tappe D, Schmidt-Chanasit J, Impouma B, Diallo AK, Formenty P, Van Herp M, Günther S. Emergence of Zaire Ebola Virus Disease in Guinea – Preliminary Report. N Engl J Med. 2014 Apr 16. PubMed PMID:24738640.